The following are my notes from the first part of a session Faye facilitated for two hundred Vancouver teachers at the Croatian Centre on Friday November 26th. Here’s the link to her Powerpoint slides. If you are going to doing something new, you must stop doing something old. If you are going to do more of this, you must do less of something else. In classrooms where all 6 strategies are in place, the impact on student learning is greater than any other intervention, including a smaller class size. Learning intentions give students a target for their learning. They help students focus their learning – especially as they transition from one class/activity to another. They also help students “return to the centre” when their learning takes them off on interesting tangents. Faye gave the analogy of a playing golf. Without the flag, your chance of “hitting the target” is very low even if you have a great golf swing. Note: learning intentions need to be bigger than a content checklist. Co-created with students. There is a danger that one goes straight to a rubric. Students need to own the criteria. Initially identify, with students, what “Accomplished” looks like and later look at what Approaching and Exceeding look like. Note: eventually one does need to move on, have closure. They need to be open-ended because that is how the learning goes into long term memory. Need to apply the knowledge to an open-ended situation to engage with it. Use strategies (like no hands up) so that everyone participates. Don’t want to have a few students contributing all the time. Having students work with a partner before any one answers reduces the risk factor for students. Faye had us do activities at our tables involving series images where all we were permitted to do was ask questions (answering was not allowed). Each image gave progressively more detail and the kinds of questions we were asking became increasing specific. This is an area that everyone at our table identified as an area of focus when we go back to our classrooms on Monday. 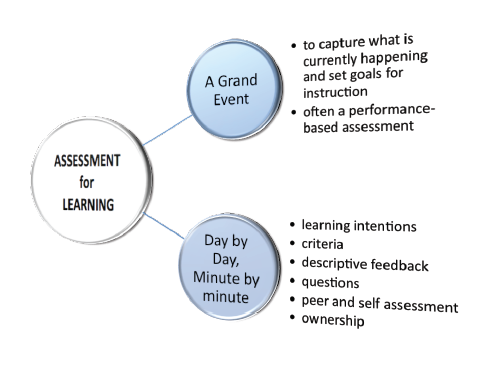 Students as the ultimate consumer of the assessment –> it informs them as to the next step in their learning. They need to know how to talk to each other to get feedback –> this is why we need to criteria (criteria that they own). Keep the end in mind. Note: if only the teacher is giving the feedback then students are going to have wait too long. Students owning their learning which increases their engagement and motivation. This the net result of the other five pieces being in place. All the fantastic examples of what each of these look like in K-12 classrooms and the various activities that we were engaged in as Faye modeled for us. This entry was posted in Uncategorized and tagged afl, assessment, literacy, Pro D. Bookmark the permalink. Hi Jacob, thanks for a shorter version of my notes! I will be working on questioning tomorrow. I love the idea that my kids should be doing the talking & not me – this is better for everyone – less tiring for me & more meaningful & engaging for them! I am hoping that my classes will be buzzing with energy Monday morning. I attended one of Faye Brownlie’s workshops not so long ago, but can’t find my notes. Can you fill me in on how the What? So What ? strategy works? Would much appreciate it. If I have it right, at my present level of understanding the three questions come from Helen Timperley in New Zealand. They seem straight forward but as I use them with students (and teachers, myself included) I am realize there is quite a bit of depth to them. For students, the first question speaks to Clear Intentions. They should be able to articulate what it is that they are learning about and the purpose for the activtiy that they are engaged in. The second question speaks to students being able to Peer & Self Assess. They need to share ownership of the Critera in order them to be able to accurately assess their progress and identify where they are in terms of reaching the learning intentions. They need to receive descriptive feedback inorder for them to be able to answer this and the third question (feedback from their peers as much as from the teacher). The third question in part speaks to the next step(s). If the student has not successfully reached the learning goal, what do they need to? What is still missing or needs more polishing? If they have reached the learning goal, what is their next step. I have to been honest, I am a bit weak with the third question and am still have much to read and reflect regarding Helen’s Inquiry Cycle but I do know that it applies to teachers as much as it applies to students. I trust this is somewhat helpful.